Chinese is a rich language with a long history and this leads to words that have many different meanings. That is, the same character or combination of characters has different meanings in different contexts. There are two different cases of this: (a) a homonym, where the words are truly different, and (b) polysemy, where there a multiple related senses of the word. Chinese is a little different from languages, like English, where more-or-less phonetic spellings are used because the same character may have multiple different pronunciations. In fact, 'spelling' does not really apply to Chinese. Determining the correct meaning for a word in a particular sentence or other context is called word-sense disambiguation. 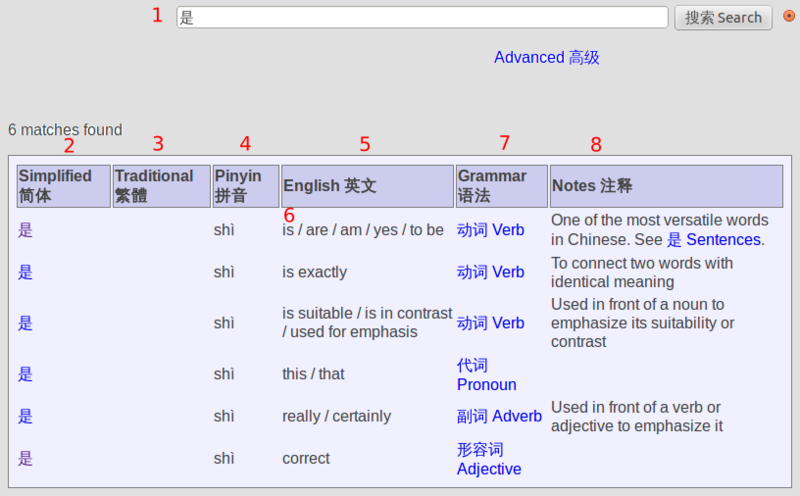 In this post I will describe how to use the www.chinesenotes.com dictionary to find the different meanings of Chinese words. Chinese words with the same character(s) may different in traditional forms, pronunciation, sense, and meaning. Let's look at an example, the character 是 (pinyin: shì), which is one of the most common words in Chinese that most often means 'is.' There are six different meanings found for this character, as shown in the screenshot below. The character is entered into the search text field (1, in red) and the Search button clicked, showing the results below. The simplified and traditional characters are shown (2, 3). In this case both simplified and traditional are the same but there are often differences with the same simplified character mapping to different traditional characters. An example is the character 台 (pinyin: tái). This simplified character is equivalent to the traditional characters 台, 臺, 檯, 臺,颱, depending on the context. The Mandarin pronunciation is shown under the Pinyin column (4). Again, this example has the same pronunciation for each meaning but this is not always the case. The character 行 has the possible pronunciations xíng, háng, hàng, and hèng, again, depending on context. The English translation of the word is given under the English column (5). The different English words separated by '/' (6) represent different approximations to the same meaning of the Chinese word. There is not often a one-to-one relationship between Chinese and English words so usually several English words are given. This also aids in translation by providing the translator with a few choices. Different lines represent different words. For example, the first meaning of 是 is 'is' and the second means 'is precisely.' These are different but related senses. An example, of the first may be: 你好，我是王。(Hello, I am Wang). An example of the second may be: A: 我觉得你你不是王。(I don't think that you are Wang.) B: 我是王。(I am Wang.) If we look at a good Chinese-Chinese dictionary you will probably find about twenty different entries for 是. However, many of them are even more closely related than this. Finally, there are notes (8) to help explain and differentiate the different meanings and senses.